For someone who started out cooking chicken breasts in a microwave oven out of necessity five years ago, home cook Derrick Kwa has certainly come a long way. 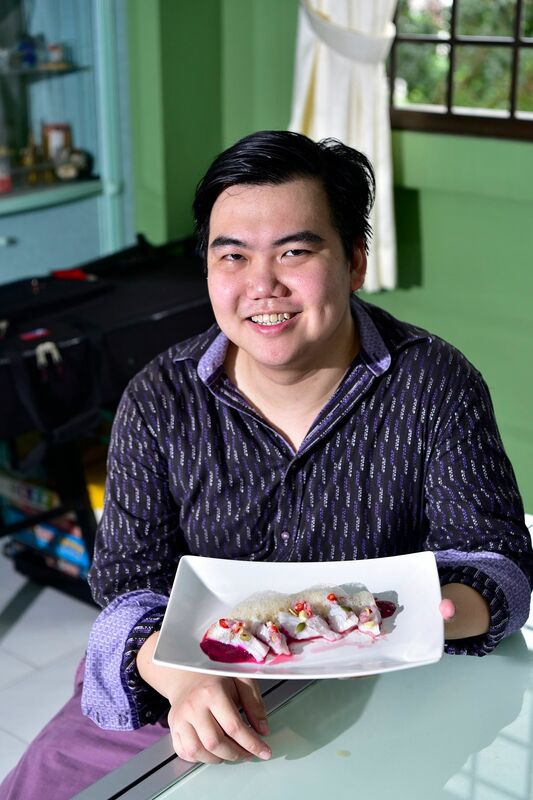 These days, not only does the 26-year-old digital marketer opt to cook with other types of kitchen equipment such as a sous vide machine, but he also thinks about flavours and textures in dishes. 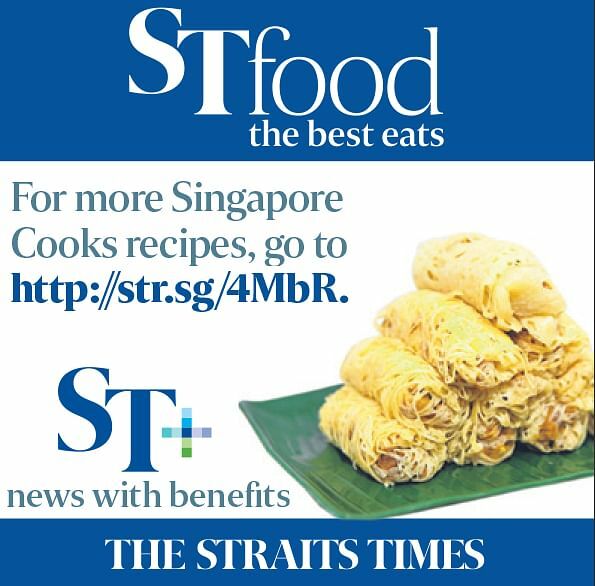 In fact, he has developed such a strong interest in cooking that he recently did a weekend stint where he took over the kitchen at Monniker, a cafe in Balestier Road, to showcase some of his own creations to paying customers. He cooked 74 covers that weekend. His dishes included Prawns And Watermelon - tiger prawns with compressed watermelon, edible flowers and a lemongrass-mint broth; and Quail, Orange, Cranberry - a dish with sous-vide quail breast, confit quail leg, orange segments, asparagus, radish, arugula, popcorn and cranberry foam. Of the experience, he says: "It was stressful and tiring. I slept a total of seven hours over two nights. I was mostly running on adrenaline, but it was a lot of fun. " He enjoyed it so much that he will be doing another kitchen takeover at the same cafe on his birthday weekend in December and has already started planning the menu in his head. The bachelor picked up cooking five years ago, when he was travelling around the world after dropping out of university in the United States. To support himself, he took on computer programming and Web development gigs, and also played in semi-professional poker tournaments. His mother is an associate professor at a business school in Singapore. Last year, he sent an e-mail to one of his favourite Singapore restaurants, the one-Michelin-starred The Kitchen at Bacchanalia in Hongkong Street, asking if he could work in the kitchen part-time. He worked at the restaurant two to three days a week for about three months, under the tutelage of the restaurant's former head chef Ivan Brehm, an alumnus of three-Michelin-starred The Fat Duck in Britain. There, Mr Kwa did repetitive tasks that included juicing and zesting limes to grating parmesan cheese to making pasta dough. He was also involved in plating the restaurant's fine-dining creations, which has, in turn, influenced the way he plates his own dishes today. He shares a recipe for ceviche with an Asian twist, served with a pink dragonfruit vinaigrette and coffee foam. "I love ceviche because of its freshness. I like light, clean and crisp flavours - I am not so much a fan of heavy sauces. I chose dragonfruit for its natural sweetness, which helps to balance the acidity of the cured fish, while the light coffee foam gives the dish a slight earthy bitterness, and that adds a different layer to it," he says. The use of foam is something that he picked up from his unpaid internship at The Kitchen at Bacchanalia. He says: "Foams have a nice mouthfeel. They have a rich, fatty texture without the heaviness of cream." While he never got a chance to make foam while working at the restaurant, he has found out through his own research that adding soya lecithin, a soya protein that works as an emulsifier and stabiliser, to liquids, can help create a stable foam. He uses this technique to create the coffee foam for his ceviche dish. Mr Kwa is applying for the professional cooking programme at LaSalle College in Montreal, Canada, and hopes to start the year-long diploma course in January. Ask him who he usually cooks for and he replies with a laugh: "Dates, mostly." He whips out his smartphone and scrolls through an album of plated dishes that he has prepared over the years - from hearty pastas to fancily plated beef that would not be out of place in a semi-fine dining restaurant. "Presentation is as important as how the dish tastes," he says. 1. Juice the limes and pour the juice into a glass or ceramic mixing bowl. Add the chopped lemongrass, chilli padi and shallots. Stir and set aside. 2. Slice the fish fillets crosswise into 2cm-thick pieces so they resemble slices of sashimi. Place them into the bowl of lime juice and mix well with a spoon. Cover the bowl with plastic wrap and refrigerate for 20 to 25 minutes. 3. Meanwhile, make the vinaigrette. In a blender, blitz the dragonfruit, apple cider vinegar and fish sauce into a smooth puree. Add more fish sauce if needed and season with sea salt to taste. Set aside. 4. In a dry pan set over medium heat, toast the pumpkin seeds for about five minutes, until they become crisp around the edges. Remove from heat and set aside. 5. About five minutes before the fish is ready, make the coffee foam. Add the soya lecithin into the black coffee. Stir until the powder dissolves. Pour the coffee into a mixing bowl and whisk vigorously for about three minutes until a frothy layer forms on the surface of the coffee (above). Alternatively, you may use an electric milk frother. The foam will hold its shape for about 10 to 15 minutes. Set aside. 6. When the fish is done, remove from the refrigerator and drain. Set aside some of the lemongrass, chilli padi and shallots in the marinade for garnishing. 7. To plate, smear a tablespoon of the dragonfruit vinaigrette onto a plate. Place half the fish on top of the vinaigrette. Spoon a bit of the coffee foam onto the fish. Sprinkle with some pumpkin seeds and garnish with the lemongrass, chilli padi and shallots from the marinade that you had kept earlier. Repeat for the second plate. Serve immediately.